It’s school time again! Kids are either excited about school or upset that summer vacations are over. Some feel nervous and are little scared as it is first day of school because everything around them seems new for eg. new teachers, new friends, and maybe even a new school. But these worries only stick around only for sometime and soon the excitement begins! Well we have the right gifts to set the mood for the first day of school from colours, to school bags, note books and water bottles, you name it- we have it! Its the end of the glorious summer vacations and back to the seat of education and learning! 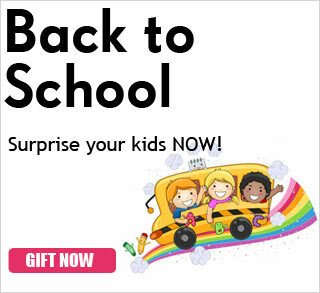 We’re sure you would want your kids to be well prepared to face the first daunting day of school after the vacations. So here’s to making school life absolute fun and delighting your tots with the cutest goodies ever. While you enjoy what’s left of summer, we’ll go explore some great new gifting ideas for the future!